Clear Door Archives - Shelving & Racking Ltd.
Our clear door lockers incorporate a shatterproof polycarbonate door providing 100% visibility. The locking mechanism has a micro sprung 10 disc lock with a hasp and staple fitment also available. The 2 compartment locker includes a double coat hook per compartment and 3 point locking. These lockers are available with a 3 digit code re-programming lock but not with coin retain, coin return or combination locks. 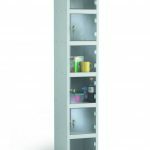 Clear door lockers are available in a choice of depths and compartment heights.